This salad is another great way to get those veggies into your diet. If you left out the cheese, it would be vegan. I love the sweet goodness of the veggies when pared with the saltiness of the cheese and olives. Preheat oven to 400 degrees Toss peppers, zucchini, and onion in a bit of olive oil, salt, and pepper. Bake for 30 minutes, stirring at the 15 minute mark. Prepare couscous according to package directions. Allow the orzo to cool a bit before adding in the roasted vegetables, olives, feta, parsley, and lemon juice. Mix well. Serve at room temperature. Refrigerate any leftovers. 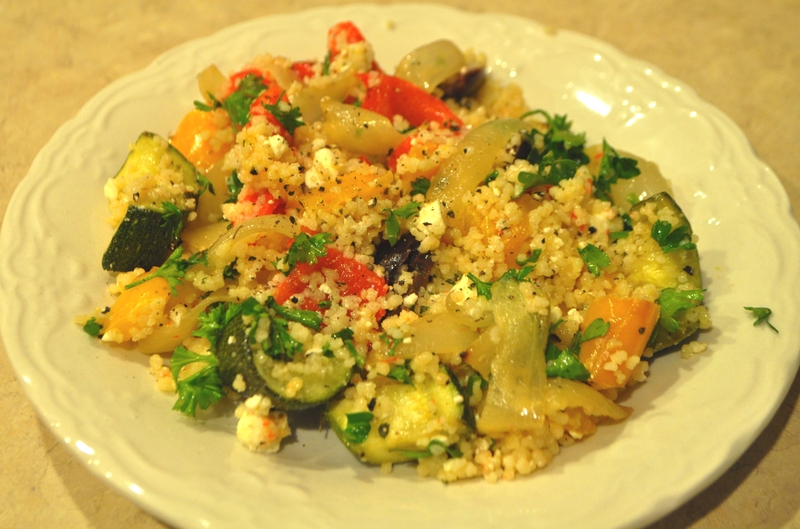 Your couscous salad sounds terrific. This would be especially good alongside of some grilled chicken. It is more of a summer dish but it was nice to have a bit of fresh flavor during this cold weather.